Each order contains 1 pound of Assorted Milk Chocolate Playing Cards. Approximately 38 cards per pound. 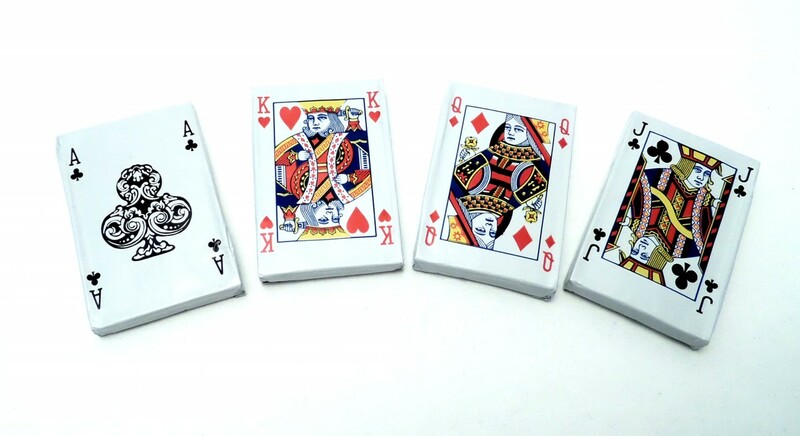 Solid premium milk chocolate wrapped in Italian foil decorated with Aces, Kings, Queens and Jacks. Great for filling giftware or party favor items, balloon weights, candy jars or table decoration. Grandparent's Day, Mother's Day, Father's Day, card party favors. Click the button below to add the Bulk Playing Cards ($.37 each) to your wish list.